North Korea's Supreme Leader Kim Jong-il takes time off from his nudist holiday to take charge of his nation's football team. PYONGYANG, North Korea -- The North Korean football team has been purged of 'imperialist-colonialist' influences after it lost 7-0 to Portugal at the World Cup in South Africa. In an announcement issued by the Korean News Press Agency, it said all those who showed bourgeois weakness in front of goal will be redeployed mixing raw uranium at the Yongbyon Nuclear Scientific Research Centre. Those whose crimes are more serious will be tied to the next North Korean missile test launch and fired in the direction of Japan. U.S. Secretary of State Hillary Clinton said, "The United States expresses its mild disappointment at dealing with a soccer loss using a purge." She added, however, that the administration was readying a new package of food aid and heating oil for the North in response to the event. The new look team that North Korea will put out for their next game. They were a 'Kim Jong-il short' when the photo was taken as one of them had to be taken away to be re-educated after questioning tactics. Taking a break from looking after the needs of his country, Supreme Leader Kim Jong-Il said he was now in charge of the team and said it had been a weakness to employ people who were not ideologically sound. Remarkably, Jong-Il said he 'blamed himself' before chuckling and saying; "I was only joking!". The new look North Korean team who still need to face Ivory Coast in their group matches . Now they will have the colourful Kim Jong-il in goal. The back four will now be hardman Kim Jong-il as left back, the centre halves are the nuclear trigger happy duo Kim Jong Il and Kim Jong-il with speedy Kim Jong-il as right back. Across the minefield midfield, North Korea are risking the heroic Kim-Jong Il, the equally heroic Kim Jong-il and not forgetting Kim Jong-il with his 'take no prisoners' approach. They can also call on the captain , the reliable and steady Kim Jong-il to make sure no one can breach their defences. Upfront, North Korea have three in attack. They are the remarkable Kim Jong-il, the stunning Kim Jong-il and the crack shot Kim Jong-Il , to look out for any openings and be able to cross the Demilitarized Zone that is the opposition goalmouth. 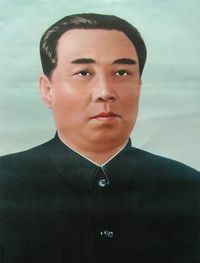 Kim il-Sung. The new permanent manager of the North Korean team. The new permanent coach of the North Koreans is their country's Eternal Leader, Kim il-Sung (died 1994) . One of his statues will be flown over to South Africa and placed in the dug out to remind all North Korean players of their revolutionary duties if they slip up again. The match will be televised live in North Korea , with about a week's delay to prevent people getting over excited in the expectation of victory. Supreme leader Kim Jong-Il said his country were in the World Cup to win it. He added that his father Kim il-Sung was convinced that their team would have won the 1966 World Cup in England but were prevented by a last minute decadent capitalist-conspiracy to prevent the 'workers team' from lifting the Jules Rimet trophy and starting World Revolution. This page was last edited on 5 June 2012, at 04:12.